In 16 innings, the Mets defeated the Marlins to extend their record to a division-leading 7-3. This is especially promising because the Mets went 1-2 in their first series against the Marlins last week, including losses to last night’s starter (Wei-Yin Chen) and losing pitcher (Adam Conley). Both teams depleted their bullpens, with the Mets using starter Jacob deGrom to pinch-hit and the Marlins using Conley, who started in all 25 of his appearances last year, as emergency relief. Neither team had any relievers left in the bullpen or any hitters left on the bench. In a head-scratcher, the Marlins used a starter (Conley) while leaving reliever A.J. Ramos on the bench. Ramos had, as Marlin Maniac points out, pitched in the two previous games, tossing 2 innings and allowing one run. Every other bullpen pitcher pitched, including Brad Ziegler in his third straight game. Sadly, the bullpen seems to be well-rested enough that we won’t get to see Ichiro Suzuki pitch tonight. Late in the game, I realized I don’t know who the Mets are likely to use in emergencies: Rene Rivera came in to play first base in a double switch in the 12th, so the backup catcher was in the game. 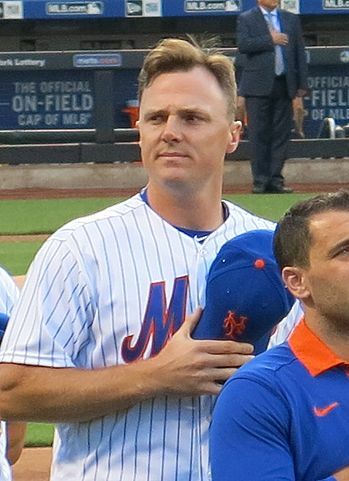 Generally the emergency catcher would be a backup infielder, so T.J. Rivera would be the logical choice, but he’d come out of the game in a platoon maneuver to make room for Lucas Duda at first. Rivera or Jose Reyes might be a logical emergency pitcher, but it seems the new Blue Jay Ty Kelly might have filled in those positions. Judging by the state of the bullpen, we may find out tonight who Terry has slated to pitch in an emergency. 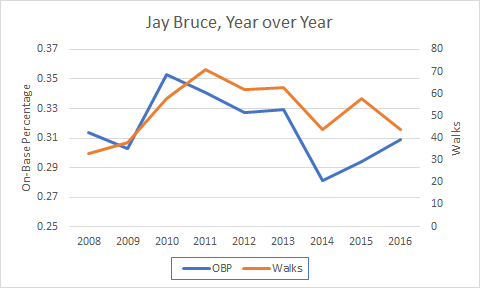 In an earlier post, I ran a quick regression (with very few datapoints) to determine that Jay Bruce‘s expected walks per plate appearance this year should be about .0838. 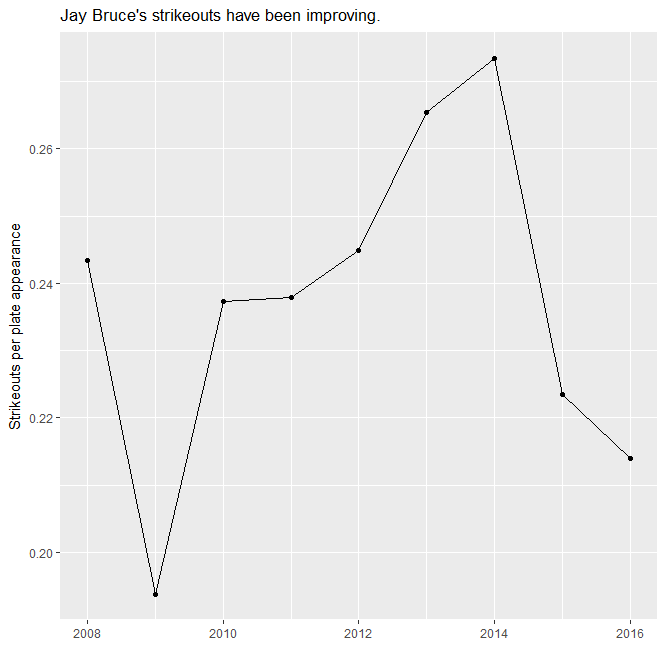 In other words, he should walk once every 12 or so plate appearances. 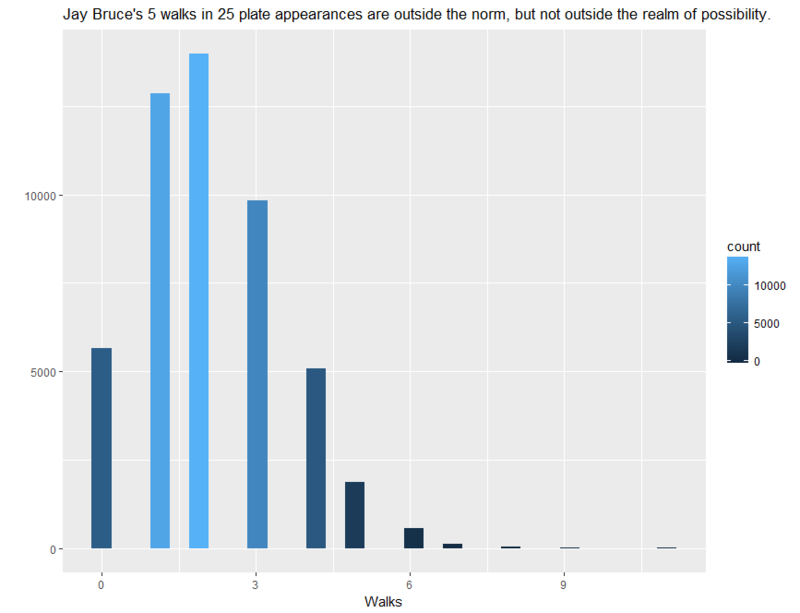 Bruce’s 5 walks are unlikely – the probability that he’d have below 5 is .947. 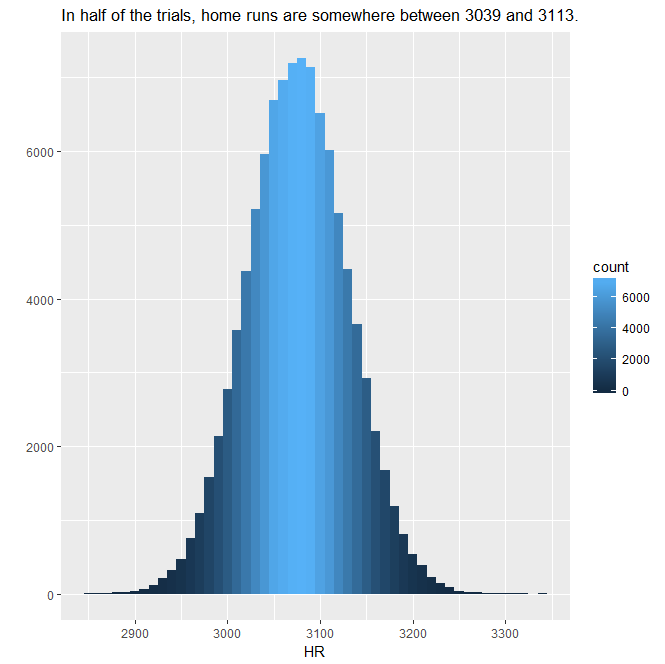 Exactly 5 would happen with probability of about .038. 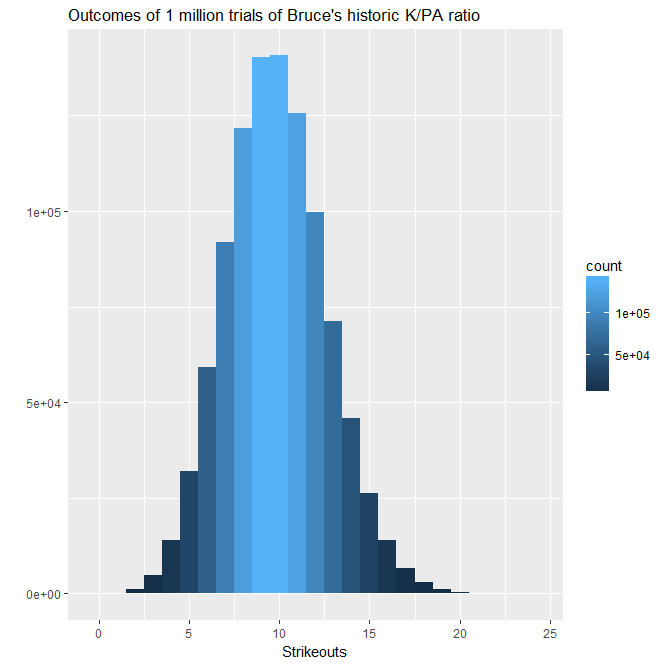 It’s not completely unheard of that Bruce would be at his expected level and have a streak of luck at the beginning of the year. However, it’s likely that Bruce has been spending extra time in the batting cages and has been working on his plate discipline.